In a shallow baking dish, season steak with kosher salt and fresh cracked pepper and toss in olive oil and vinegar to coat; set aside at room temperature. Meanwhile, heat a salted pot of water to boiling over high heat, add orzo and cook until al dente, 3 – 4 minutes; drain and set in fridge to cool 15 minutes. Heat grill over medium high heat and grill steaks 2 – 3 minutes per side for medium rare; remove from heat and allow steaks to rest. Remove chilled orzo from fridge and add remaining ingredients along with 1/2 cup of extra virgin olive oil. Toss well to combine and plate. 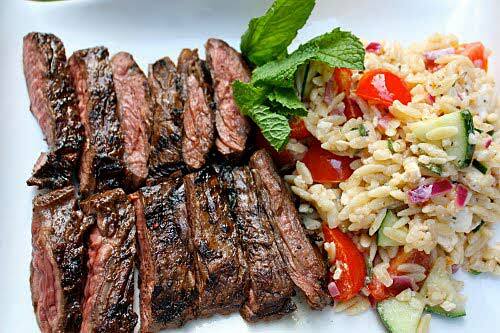 Slice steak thin and on the bias and plate next to orzo salad. Serve immediately. Reproduced courtesy of The Art of Manliness, 30 August 2011. This design is wicked! You most certainly know hoow to keep a reader entertained.